Johnny hears those words and fear creeps into his eyes as his sensei orders him what to do next. As if sensing his student’s fear, Kreese looks at Johnny and says, “You have a problem with that?” And Johnny, dumbfounded, simply responds, “No, sensei.” Reinforcing his order, Kreese follows up with, “No mercy,” and sends Johnny back onto the mat. Even if you hadn’t seen any of the rest of The Karate Kid, you know there is something seriously wrong here. The order Kreese just gave has an ominous tone to it and you know he’s just ordered this young high school student at a supposedly friendly competition to maim and injury his opponent. And for what? For a trophy? But it’s not losing the trophy that has Kreese fearful. It’s his sense of pride. In his arrogance, he never imagined young Daniel LaRusso would have been able to make it this far in the tournament, let alone be up two points to none against his prize student in the title match. His whole sense of self-esteem is built on the backs of his students and to see them fail (and to him anything less than the title is failure) is unbearable. And when he does lose, his entire world crumbles around him. He loses first his composure, then his sense of self, then his sanity, his students, and his dojo. All because of pride. C.S. Lewis, the famous author and theologian describes pride as “…the essential vice, the utmost evil… Unchastity, anger, greed, drunkenness, and all that, are mere fleabites in comparison: it was through Pride that the devil became the devil: Pride leads to every other vice: it is the complete anti-God state of mind.” But is that always true? I’m certainly proud of Emma. When I listen to her playing violin, when she comes home with a good grade, when I find out she did something selfless and nice for another classmate, I can’t help but be proud. Is that bad? Can you be a proud parent and not be the tool of the devil? Turns out you can. If you have a Bible or a Bible app on your phone would you find the Gospel of Luke, chapter 18 beginning with verse 9. Luke 18:9. According to psychologists, there are two types of pride – hubristic and authentic. As you can imagine, hubristic pride is the type of pride often looked down upon. It’s the kind that got John Kreese into trouble. Whereas authentic pride is the kind parents feel for their children or friends might feel for each other or that you might feel for something you accomplished. There were times I wasn’t sure I would make it, but thankfully I never saw the pick-up cart! 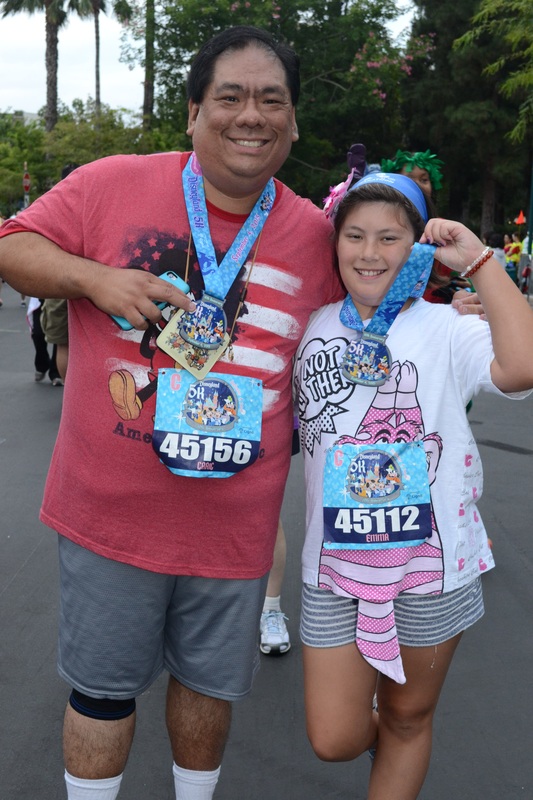 I have to admit I was pretty darn proud of myself when I completed the Disneyland 5K. Being both flat-footed and overweight, I wasn’t sure if I would make it ahead of the pick-up cart. The pick-up cart is a little tram-like vehicle that goes behind the runners, and if you fall too far off the pace, you’ll get “picked up” and won’t get to complete the race. I walked/ran (but mostly walked) slightly out of fear of seeing the pick-up cart behind me, but not only did I finish, I never saw the cart at all. I felt a swell of pride! Not because I beat anyone. God knows my time was nothing to write home about. But because I set a goal for myself I wasn’t sure I could complete. And that’s the main difference between the two types of pride – hubristic pride is competitive by nature. It requires you to “beat” someone. It means that others have to be less than for you to feel accomplished. C.S. Lewis, in his book Mere Christianity, put it this way, “Pride gets no pleasure out of having something, only out of having more of it than the next man. We say that people are proud of being rich, or clever, or good-looking, but they are not. They are proud of being richer, or cleverer, or better-looking than others. If everyone else became equally rich, or clever, or good-looking there would be nothing to be proud about. It is the comparison that makes you proud: the pleasure of being above the rest.” Hubristic pride is always felt at the cost of someone else. That’s the lesson we see in the Bible as well. If you thought humblebragging was a 21st century thing, the Pharisees thought of it first. This guy comes up to the temple and belittles the tax collector in front of God. He probably doesn’t know him from Adam (or Eve for that matter). But he feels the need to elevate himself by making the other guy look bad. You can almost sense the insincerity of this Pharisee as he gives “thanks” to God. We all know in reality he’s just trying to make himself look good. He’d be better off just bragging about himself. According to a study done by Harvard, humblebragging is the most despised form of bragging because it is so insincere. People would prefer you just come out and tell us how wonderful you are than try to disguise your bragging as false humility or a complaint. But nobody is fooling God. Jesus tells us in this parable, it is the tax collector who receives forgiveness in God’s eyes. Like most of us, God sees through this humblebragging easily and isn’t impressed. The problem with hubristic pride is it constantly needs to be affirmed. The braggart isn’t bragging because he is so self-confident. He is bragging because he is looking for affirmation that he is worthy. His “self-confidence” rests only on the belief that other people are not as good as he is. That’s why John Kreese feels so threatened by Mr. Miyagi and his student, because to lose to a Japanese handyman and his incompetent student would crush his sense of self-worth. The foundation for his sense of self rests on being better than other people. The thing is, if that is the basis of your self-worth, you are doomed. Around the corner there is always someone who is faster than you, stronger than you, a better marksman than you. There is always someone better. That’s the nature of being at the top. Eventually, you aren’t any more. Someone once wrote, “greatness is indeed on loan temporarily from the Gods (or God, but that’s not what was written).” But sometimes, when pride is at its worst and we become so desperate to maintain our belief in ourselves, we will do unconscionable things to keep ourselves there. Cheat, lie, steal, even harm others all in the name of pride. Instead, God wants us to be confident in ourselves without needing others to confirm it. To some degree, we are all probably a little bit guilty of hubris. The danger is in letting that become how you define yourself. If you’re sense of self-worth is only based on how others see you, if you feel the need to compare yourself to the Joneses, if you care so much about being “the best” that you lose your moral compass, you are in real danger of letting the evil in this world overwhelm you. Jesus once said, “What good will it be for someone to gain the whole world, yet forfeit their soul (Matthew 16:26)?” This is how evil works in the world today, by making you feel unworthy unless you have more than everyone else, unless you’re more powerful than the next guy, when we are already loved by God who values the person you already are. In The Karate Kid, Daniel asks Mr. Miyagi what kind of belt he has, and Mr. Miyagi answers, “Canvas. J.C. Penny, $3.99. In Okinawa, belt means no need rope to hold up pants!” After laughing for a bit, Mr. Miyagi says, “Daniel, karate here (points to head), karate here (points to heart), karate never here (points to belt). Understand?” Mr. Miyagi is telling Daniel what God is trying to tell us, to know your own self-worth and not let it be defined by the outside world. God loves you for who you are and simply wants you to be the best version of you that you can be.